Anne with supporters of her proposed Bill Margaret McCulloch MSP, David McColgan (BHF), Helen Reilly (BMA), Jim Hume MSP, Gareth Brown (SYP), and Hanzala Malik MSP at the Scottish Parliament on Tuesday 6th January. 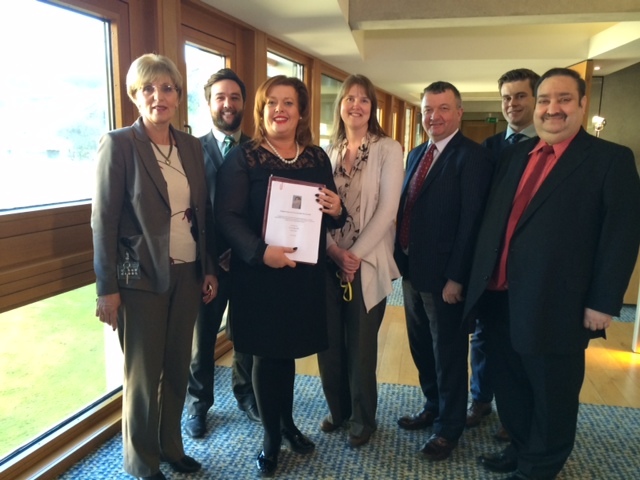 Glasgow Labour MSP Anne McTaggart is seeking support from fellow MSPs for her proposed Organ Donation (Scotland) Bill. This follows a four month consultation period during which time 529 individuals and 30 organisations provided their views on the proposed legislation, with 80% of individuals indicating their support for the Bill. The Bill proposes to amend the current ‘opt-in’ system of organ donation in Scotland, whereby those wishing to become a donor are encouraged to add their name to the NHS Organ Donation Register. The Scottish Government’s own evidence shows that whilst only 5% of the population oppose organ donation in principle, less than 40% of people are registered as organ donors. Ms McTaggart’s proposals would mean that unless an adult had expressed an objection and ‘opted-out’ of the organ donation register, then their organ and tissue could be removed posthumously. In view of the significant difference between the number of people on the waiting list for transplant operations and the number of organs available, Ms McTaggart believes that reform is now essential. Ms McTaggart will now have a month to gather signatures of support from 18 of her fellow MSPs from at least half of the other parties in the Scottish Parliament. “I’m proud to be able to lodge my proposed Bill today and will now seek to gain support from across the Scottish Parliament for my proposals. The current system of organ donation has been the subject of much debate for a number of years, due in no small part to the fact that the UK has one of the lowest organ donation rates in Europe. The truth is that people just don’t get round to putting their names on the organ donation register, and this results in the deaths of three people every day across the UK. I’ve met too many heartbroken families to let this needless loss of life continue. For me, it’s important that those who object still have the opportunity to opt-out and I strongly believe that the family should be consulted at the time of death to establish any objection of the deceased that had not been registered. “A substantial majority of the existing research shows that countries that use a soft opt-out system have hugely increased donor rates which, in turn, save lives. “The BMA has long been a supporter of a move to an opt out system of organ donation, not only because we believe that it would have a positive effect on donation rates, but also because it gives added protection to those who do not wish to donate and makes it more likely that those who are willing to donate will be able to do so. All consultation responses and the consultation summary can be read here.